Most employees, at one time or another, have to go through what is called a performance review. A part of that review may include answering questions like “What have you accomplished over the last twelve months?” and “What are your goals for the coming year?” This is not fun, right? We dread these things. And what we may dread most is the part where we have to list our strengths and weaknesses. Strengths are relatively easy: One can always write something like “hard worker,” “team player,” “conscientious.” Who could argue with those? They’re general enough. But what about weaknesses? Because whatever we write, we’re admitting we aren’t perfect. We aren’t wonderful. We have flaws. We don’t measure up. That we are, to use Paul’s word, weak. No one wants to think of themselves as weak. In our culture, weakness is bad and strength is good. The physically strong win in sports. The mentally strong do well in academics. Having just this week observed Independence Day, and eaten some swell bratwurst here at church I must say, we celebrated our nation, the freedoms we have, and the military that protects those freedoms. Who would shoot off fireworks because they live in an inferior nation? You ever see someone celebrate, “Our country stinks!” Yes, strength is good, and weakness is bad. Everyone knows that. And as a result, we’re taught to cover up anything about us that can be seen as a sign of weakness. A father will tell his son who has burst into tears, “Big boys don’t cry.” Because in our culture, crying means weakness. It shows that we are too fragile. Too emotional. Too vulnerable. Signs of weakness, we are taught, are to be avoided. But, St. Paul in our text tells us that he can boast of his weakness, because Weakness Allows the Believer, Allows You and Me, to See Christ’s Power at Work. Don’t get me wrong. Paul was a man who could be proud of all he’d accomplished. No problem with an annual review for him! He was intelligent. He had been trained by Gamaliel. Paul had a way with words. He had preached to thousands. Now on the bad side, Paul has the honor of preaching a sermon that was so long that a dude (Eutychus) fell asleep and fell out of a window to his death (Acts 20). Nevertheless, Paul was, in his day, bigger than Billy Graham and a dozen other preachers combined. He’d been given a special revelation on the road to Damascus, where he’d seen the risen Jesus with his own eyes. And in the early verses of our text, he speaks of another great revelation he had. A vision of being taken up into heaven to see its wonders. Think about how that would look on his resume! Paul: a man given access to the glories of heaven! But instead of boasting about how great an evangelist he was, Paul tells us that he rejoices instead in his weakness. And he points to one example. A shortcoming, an ailment, or a failure of some kind that he’s unable to do anything about. He calls it a “thorn” in his flesh. Have you ever had a splinter under your skin? Splinters can be annoying. Usually, you have to get a needle and tweezers in order to remove a splinter. In our home, my wife is the pro: she’s blessed with a steady hand. But I don’t think St. Paul is talking about a splinter stuck under his skin. Instead, we get the idea that it’s a bit more serious than that. People have speculated what the thorn St. Paul refers to really was. Was it people who opposed his message and ministry? Was it some temptation to which he was particularly susceptible? Was it a physical problem such as poor eyesight or a stutter? Was it some painful illness like kidney stones or a bad back? We don’t know. But we do know that Paul thought it was serious. Serious enough, in fact, to pray three times that God would remove it. Paul thought that he’d be better off without. But then again, you know that if nothing were ever to go wrong in your life, you’d begin to forget that you even need Him. If we never faced struggles of any kind, we’d begin to think that we could make it on our own. After all, with no problems in life, who needs a problem solver? There is, of course, one problem, one thorn in our flesh, that on our own we can never do anything about. It is the sin that is in here. No amount of digging with a needle and tweezers will remove it. No amount of self-discipline can eliminate it. No, we’re stuck with it because of who, what, and where we are: weak, sinful people living in a fallen world, led astray continually by the devil. Sin is the ultimate sign of weakness. We strive to hold it down, but we’re never able to master it. The same “thorns” keep coming back again and again. Like Paul, our sinful human pride tries to make us believe that we are better, stronger than we really are. What sins have you tried to overcome, only to fail over and over? Lust? Laziness? Lack of spiritual energy? I don’t know what it is for you, but you do. Even though we know our God is not happy that we have these weaknesses, these failures, and the wages of sin is death, we keep doing them. We can’t stop. There is truth in that, isn’t there? As Christians, we know what we should do, how we should act, and how we should speak. Then we turn around and utterly fail to do what Jesus calls us to do. The reason? We are weak. With St. Paul, we admit: “For I know that nothing good dwells in me, that is, in my flesh. For I have the desire to do what is right, but not the ability to carry it out” (Rom 7:18). We are all suffering from a thorn in the flesh (2 Cor 12:7) called sin, and we ourselves cannot remove it no matter how hard we try. But our gracious and loving God didn’t leave us to face this thorn in the flesh, this weakness, on our own. In His mercy, He sent His only Son, who put on our weak human form to make the payment demanded for sin. Jesus is all God and all man, and He was killed on a cross to pay for our sins. In his First Letter to the Corinthians, St. Paul tells us that the world in his day saw the cross as the ultimate sign of weakness. The usual response to the Gospel by nonbelievers was this: “How could the all-powerful God of the universe be nailed to the cross to die? That’s foolishness!” But Paul responds that even in His weakness, God is stronger than man’s strength. By humbling Himself to death, even death on a cross, Jesus paid for all the sins of the world. Yes, by becoming weak, Jesus conquered Satan and sin for all time. And on Easter, He showed His true strength by rising again and defeating death for each of us, once and for all. Now, through faith, Jesus Christ’s power rests upon us. Through our Baptism, the Holy Spirit is in us and gives us the power to live as Jesus people. 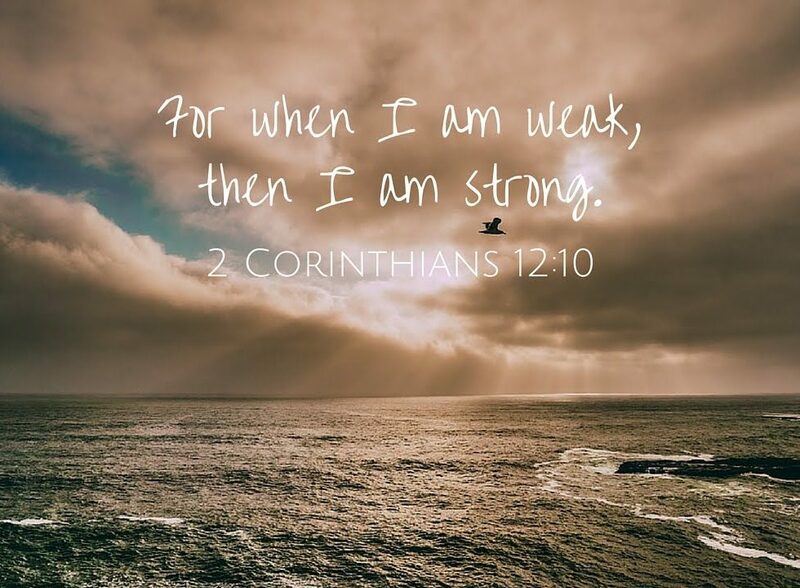 We share His love—imperfectly, even hypocritically, to be sure—but never giving up, using the strength He gives us to keep ‘er movin.’ It is just as Paul says: “For when I am weak, then I am strong” (v 10). Jesus turns our weakness into strength, using our faults to help us see that we can never get forgiven by what we do, so that we must rely on Jesus and Him alone. With this truth made clear in us and through us, we use His power to seek, to share, and to serve. One day, unless Jesus returns soon, we’ll all face the ultimate sign of the weakness of our humanity: death for this thing will come knocking. And while our culture sees death as weakness, for us it takes on new meaning in the shadow of the cross and the open tomb. The cross and grave, signs of weakness to the world, are signs of power for our lives. Because of Jesus’ death and resurrection, we will never die. As Jesus told St. Paul: “My grace is sufficient for you, for my power is made perfect—made perfect!—in weakness” (v 9). Adapted from Concordia Pulpit Resources, Vol. 29, Part 3.